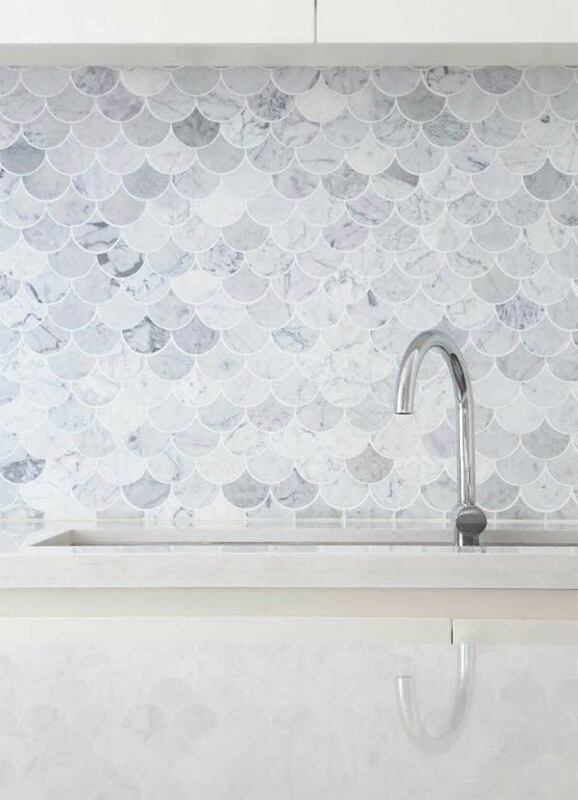 Fish Scale Tiles For Flooring & Splashbacks – How Mermaids Are Making A Big Splash! Mermaid Tiles Meet 2019 Colours! 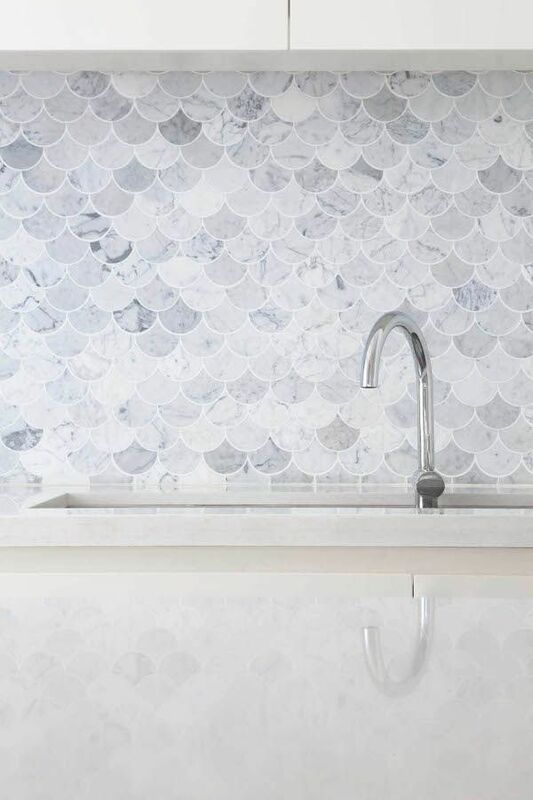 Ranking highly in our home decor guide for 2019, fish scale tiles are soon to be pride of place in all the homes that have one eye on the latest trends. From spectacularly bedecked walls to glamorously surfaced floors, no space is safe from the siren call of the sophisticated mermaid. 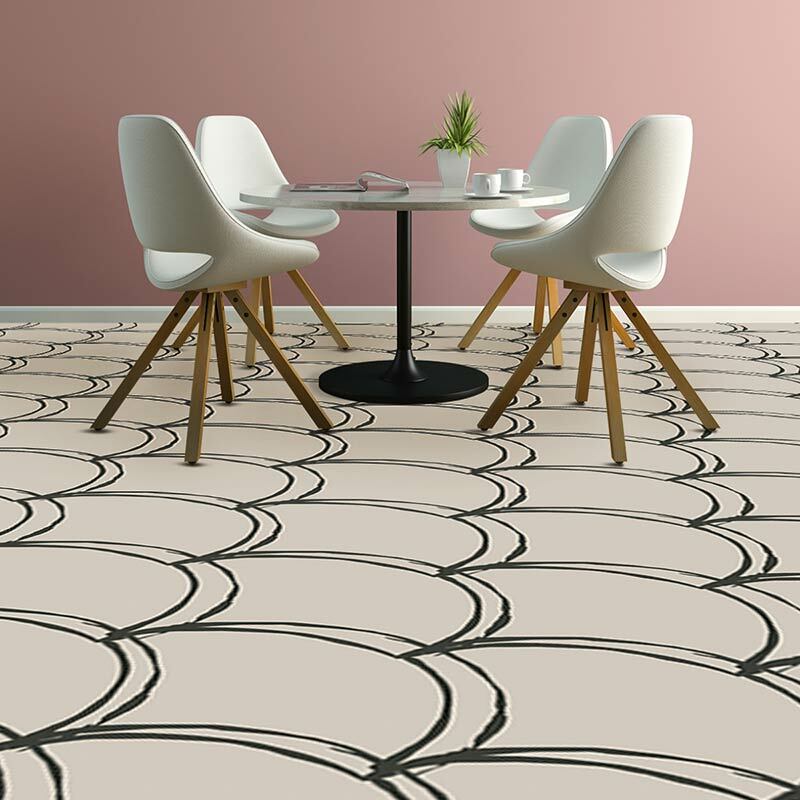 Our new flooring and glass ranges take this fish scale tile trend and turns it up to eleven-ty! 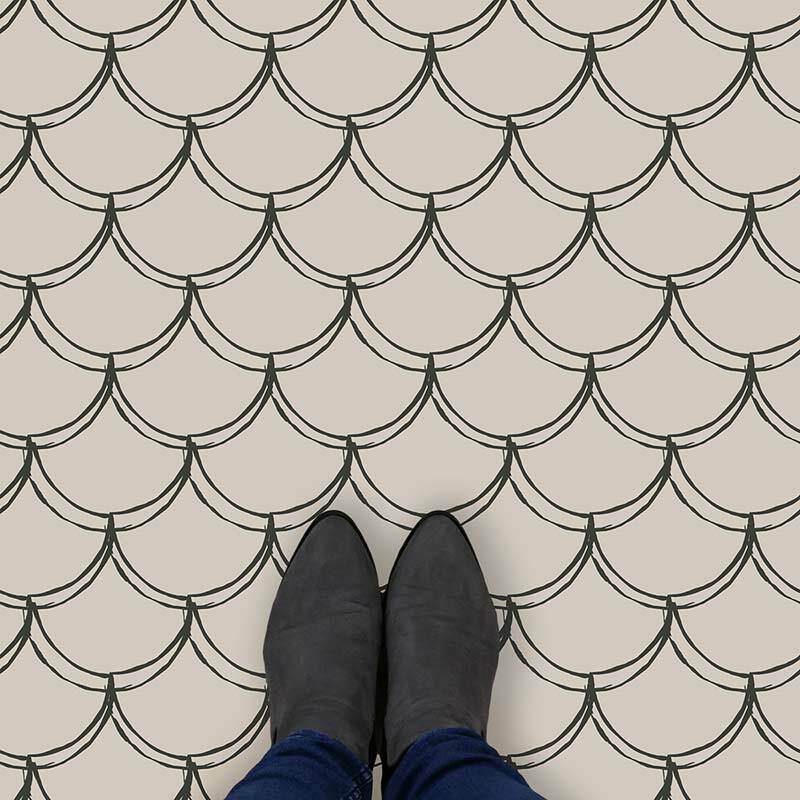 The title of fish scale or mermaid tile seems to be the pattern’s nom de plume right now, but this shapely motif has more pseudonyms than you can shake a tail fin at. Calling them ‘Moroccan tiles’ is understandable as this region claims ownership of many of these bold tile shapes. ‘Arabesque’, like Moroccan, is another broad descriptive name that although can be used for this shape it can also be claimed by other shapes with a similar feel like the quatrefoil or paseo. ‘Ogee drop’ is another less used name but it is quite probably the correct one for the shape itself. An ogee is an S-like curve containing two arcs that curve in opposite directions making the ends run parallel. With the arch across the top, the shape becomes known as an ‘ogee drop’. 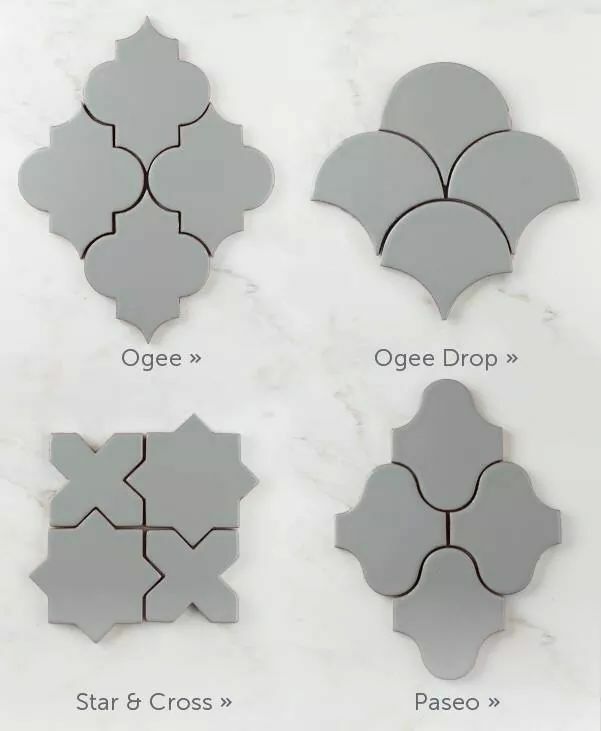 Although this could well be its right name, no-one goes into their local Massive Tile Shop and asks for an ogee drop tile. Probably is the reason they’re more popularly known as mermaid or fish scale tiles. Its all in a name and if that name describes it perfectly, then that’s the name! When turned upside down, (or right way up if that’s your thing), you can easily see why they also go by the name ’Teardrop tiles’. 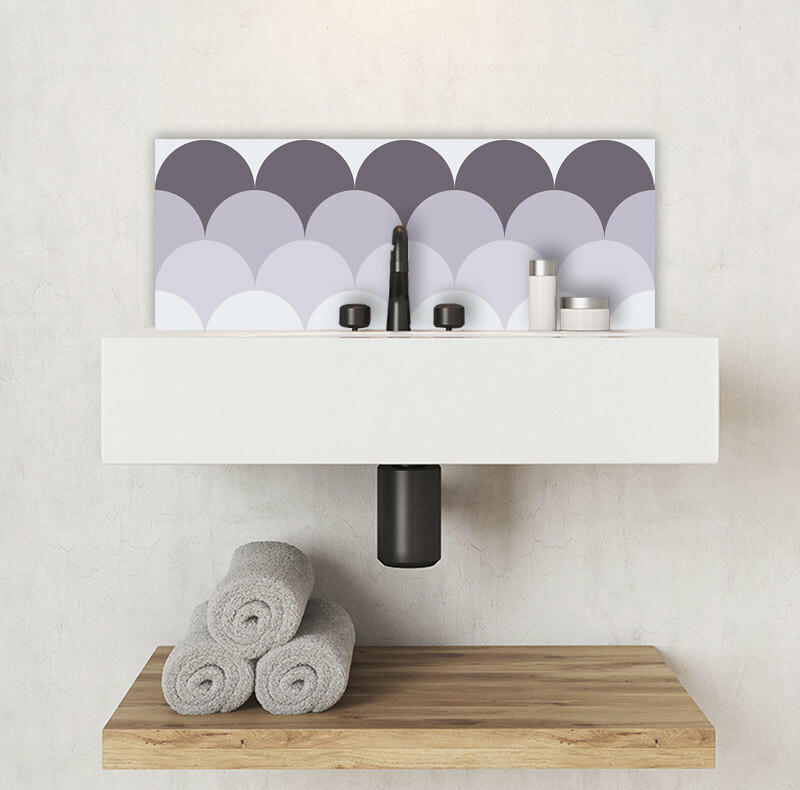 Used as individual ceramic tiles to build up a splashback or shower wall, it sure is an exquisite look. Coupled with a light or darker grout, there are real design choices for style and feel. On an aside, I can’t believe the options there are now for grout colours. It almost as hard to pick what’s in between the tiles as picking the tiles themselves! Individual tiles though can be incredibly time-consuming to fit. Not to mention also fiddly to put in place and keep there while waiting for the grout to set. If it’s a large space that needs covering, it can be a daunting job for anyone but the most seasoned professional. 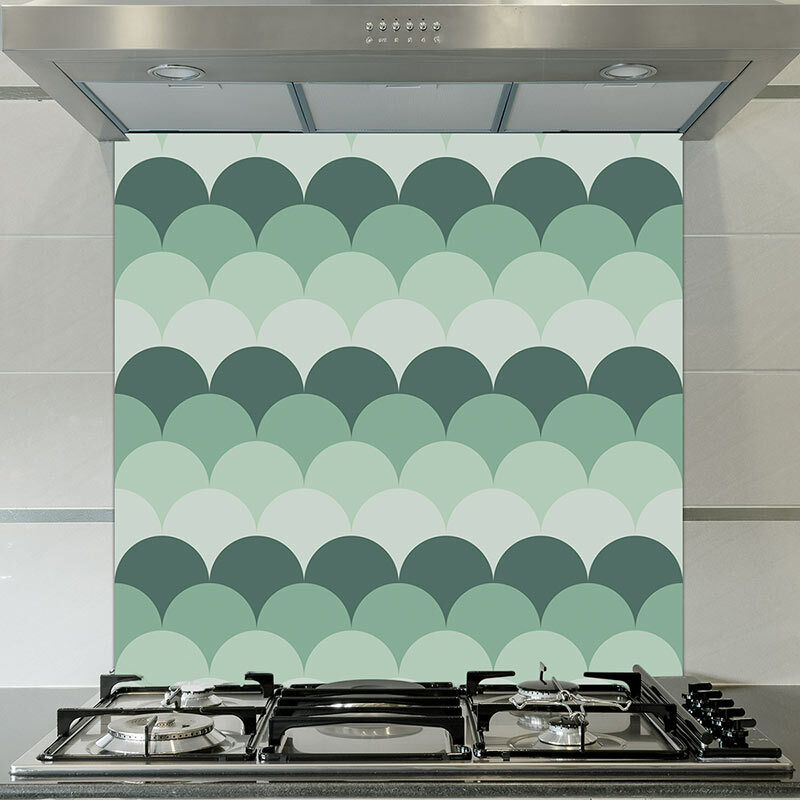 By printing the tile shapes onto glass for our fish scale splashbacks, we can make the fitting and install a thing of simplicity. We can also change the colours to match your room and the size of the fish scales to match your kitchen or bathroom vision. All our glass splashbacks and Feature Tiles are printed on the reverse of the glass and sealed in to ensure they look great for longer. The production team here has got years of experience printing onto glass and we know they’ll last and last for years. 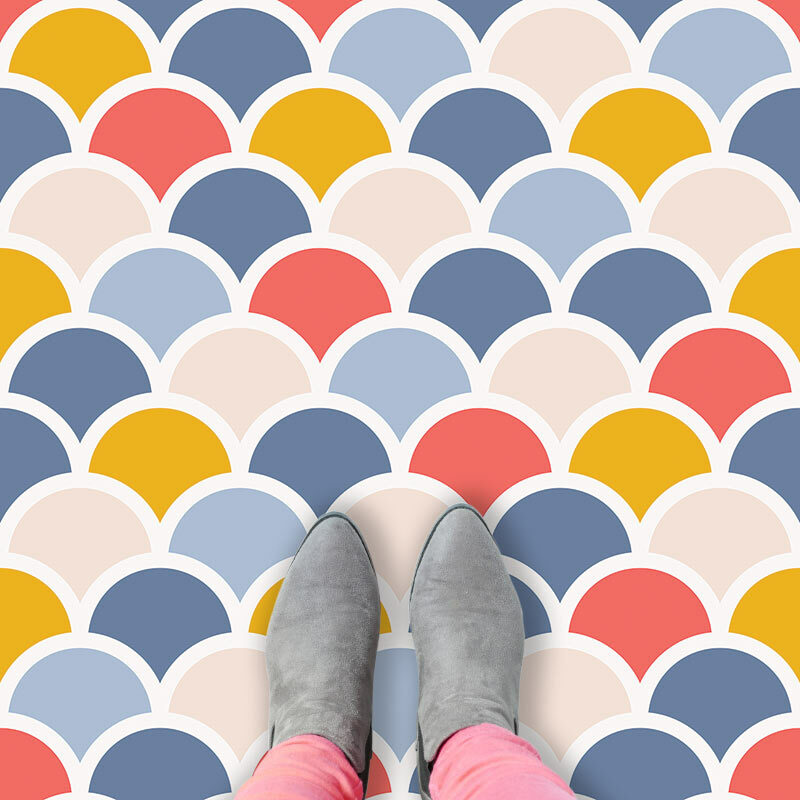 Their gorgeous scallop-y patterns and bright and bold colours are guaranteed to put a smile on your face everytime you wander into the room! 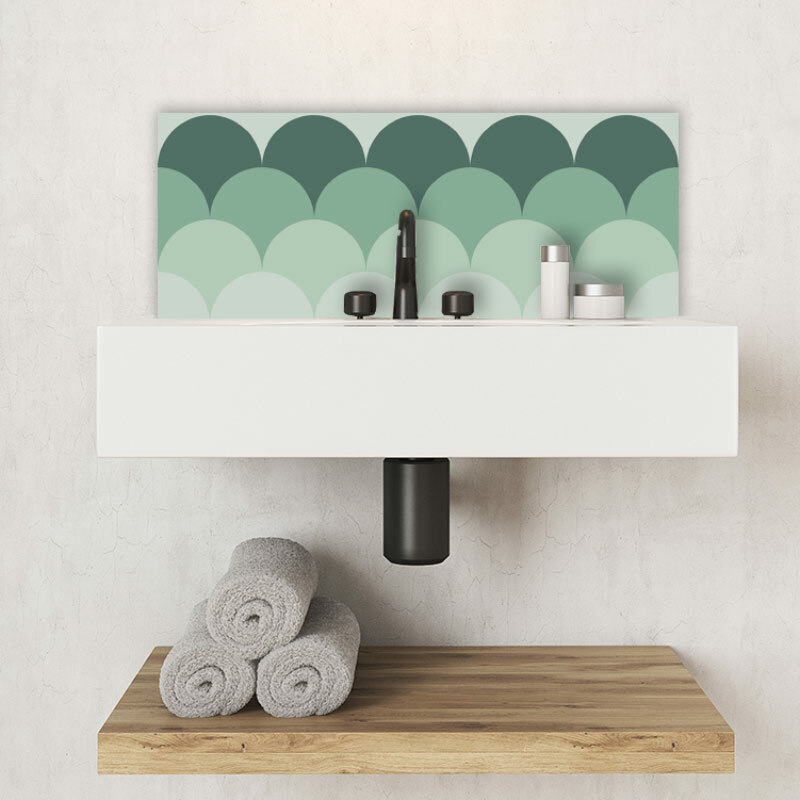 A mermaid tile splashback could be just the thing to lift your space and help your home be the one everybody loves! 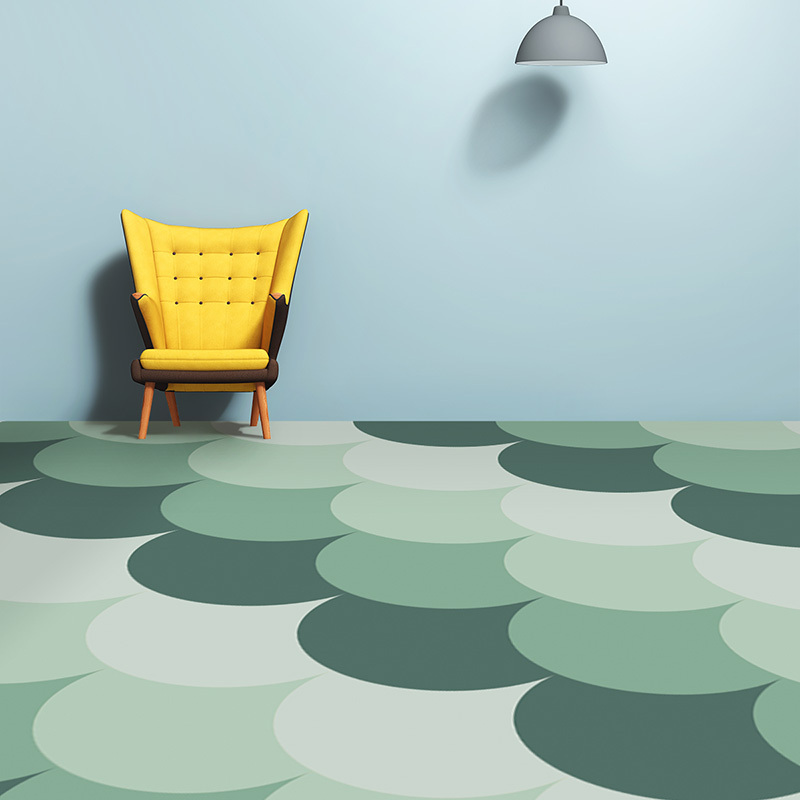 Fish scale tiles really find their head-turning vibe when printed on our exclusive vinyl flooring. 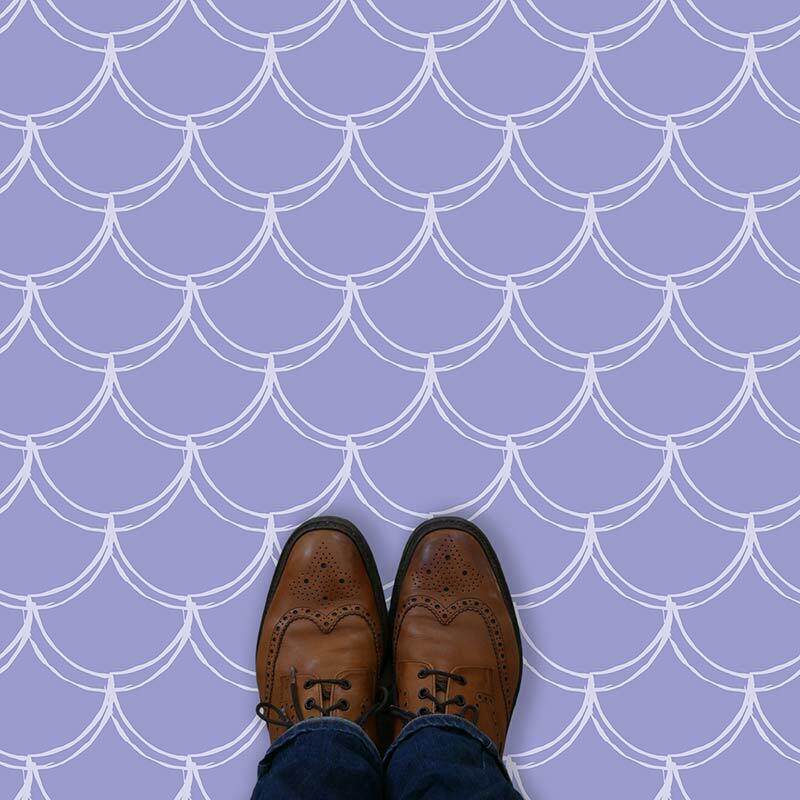 We love the beauty and imposing style of the large fish scale floor tile – elegantly scalloped and oh-so eye-catching. If you’re going to do something different in your home, go for it! Larger pattern? Just tell us. 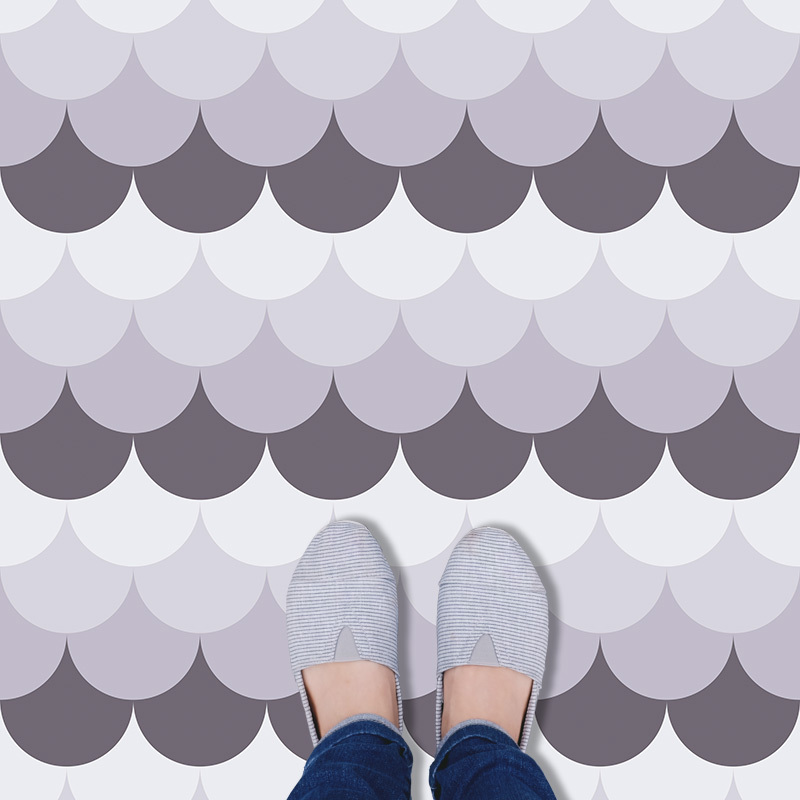 Fish scale tiles are ideal for shifting 45 degrees and printing the pattern so it flows diagonally across your room. This technique, called ‘on point’, makes the room look bigger by making the pattern appear larger. Nifty trick and its a simple change for us prior to producing your flooring. Another flooring hack is to install your flooring with the fish scale pattern parallel to the longest wall. It will help make the room look much more spacious. Select a design that flows along from one end to the other and it’ll make your room look like it runs on forever. 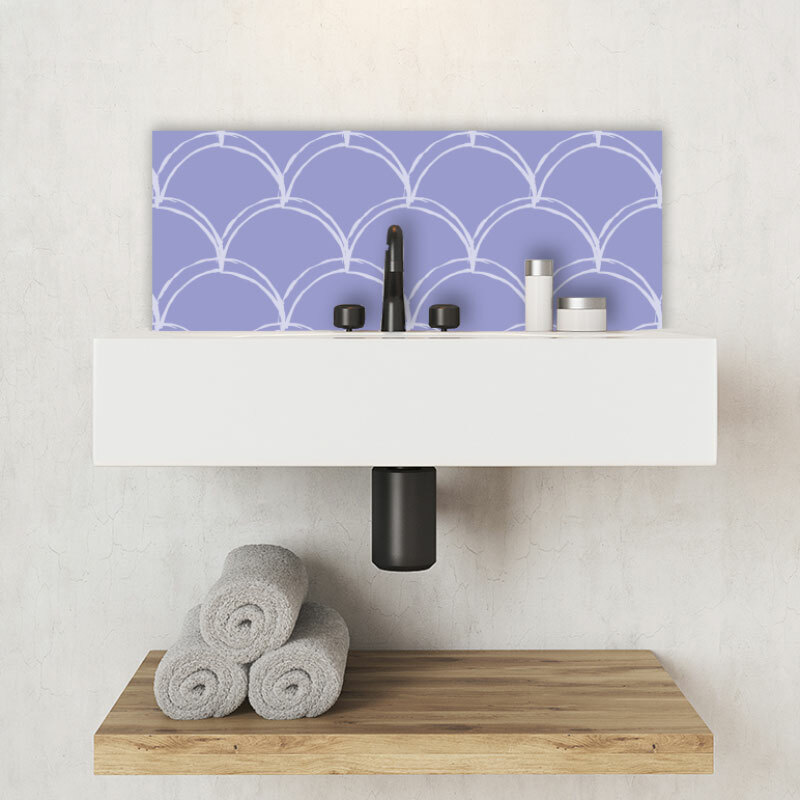 Large-scale mermaid tile designs will make your space appear more expansive than a smaller pattern with many repeats. It’s how the eye takes it all in and bigger and brighter is a neat visual trick for making a smaller room look much grander and more imposing in size. If you are looking to match the walls with your new flooring, pick an accent colour in one of them and pair with that. A smidgen of similar colours gives a uniformity that adds a dash of sophistication but too much can blur the overall feel. When it comes to picking the perfect fish scale flooring, we produce visual proofs showing your changes before we go to manufacture. Only when you are A-okay with your mermaid tile flooring will we send it over to production. Sophisticated shapes and on-trend colours matched with the ease of installation when its all sent directly to you on a roll. And now our vinyl can handle panels at up to 2.9m wide. You might not even have any joins to match! We’re doing all we can to make being individual as simple as simple can be. Vinyl samples are available of all our patterns so if you’re ready and looking to start your flooring fairy tale, fill out the box under each design and we’ll pop them in the post for you. 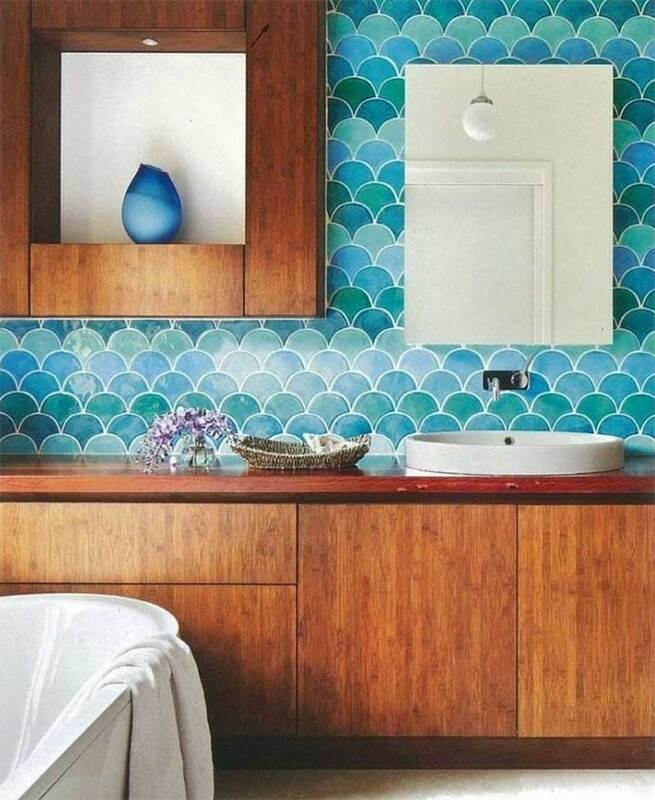 Fish scale tile ideas for flooring, splashbacks and Feature Tiles – take off those water wings and jump right in! Victorian Vinyl Flooring – Traditional Designs Meet Modern Style! Home Decor Trends 2019 – Will Your Space Sport Next Year’s Style?